You are here: Home / Home Management / Hail Jenny, Giver of Scrumptious Biscuit Recipes! Hail Jenny, Giver of Scrumptious Biscuit Recipes! I successfully baked another winner-of-a-recipe this morning. This time the recipe was from Jenny over at Runningamuck which she called "Big Daddy Biscuits." I put this biscuit recipe on my list of 13 Blogger-tested Recipes, but I hadn't made them as of that post. But now that I've made them, I think I'm in love! Jenny was spot-on with this recipe; the biscuits practically melt in my mouth. I will definitely be making these again. But I think I'll also try freezing the cut-out unbaked biscuits, too, to see if they come out as good when baked from the freezer. I'd love for the kids to be able to bake them on their own by grabbing them out of the freezer and throwing them (not literally) into the oven to bake. I'll make sure to post if that experiment is successful. 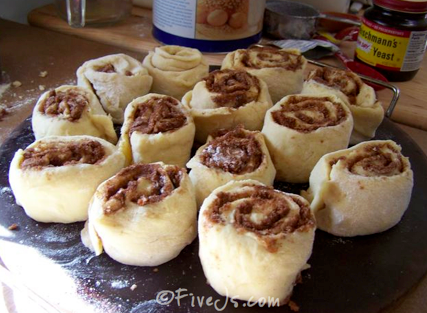 Cut shortening into dry mixture using a pastry cutter until all the shortening is in very small pieces. Add milk a little at a time until you get the desired consistency. You can mix this pretty thoroughly, just don’t beat it to death as that tends to “kill” the baking powder and its ability to make the biscuits nice and tall. Flatten out with hands and cut into biscuit shapes with a large cup or mug. Place on ungreased cookie sheet and bake for 10 -15 minutes at 425 degrees. I think the freezing idea is great! Can't believe I haven't tried it before! We go rv-ing quiet a bit and I often make these up before we leave and just roll the dough up in plastic wrap and store in the fridge. They still come out perfect and there's nothing like a batch of fresh hot biscuits in the morning with no prep work – and no dishes! lol. I'm looking forward to hearing whether or not they freeze well. Thanks! Hail Kate, Giver of Delicious Cinnamon Roll Recipes!